A pattern or certain behaviors keep repeatedly presenting in your life - and you’ve worked on your energetic boundaries* then it might be time to start asking what do you want in your space. *What is it that You Allow in Your Field? Yeah, Fake it till you make it. Walk like a Chicken, when you’re still like a Duck. The Perfect Living situation for our family, is Manifest. The perfect space, the perfect place. Right then, everything lined up. 2 months later I moved in. When it’s the right time for something that you’re manifesting (consciously attracting into your life) to appear, it will. Be aware, that most of the time we’ve been unconsciously manifesting crap into our lives - by not being conscious of what we’re letting our thoughts think about (yes, letting because we are learning Now to master our own thoughts). The perfect time for your manifestation may be in 2 years, under the most perfect circumstances for your situation. Think about it - if you’re in a relationship that doesn’t fit into your new Daily Mantra of ‘I Allow Myself To Receive All The Joys in this Life’ or ‘I Am Surrounded By Joy’.....then it might take sometime to get to the point that you find yourself released from that relationship. Making space for the Relationship which now is the perfect match to what you Now consciously choose to Manifest. Or it can be next week. Whichever way - the Perfect Time. 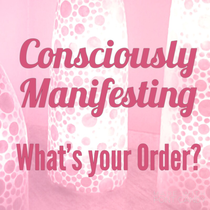 Allowing your Beautiful Manifestations to Manifest into our physical world.